Franco Dok Harris was born March 7, 1950 at Fort Dix, New Jersey. He was one of nine children. Franco’s father was an African-American soldier who had met and married Franco’s mom in Italy. After leaving the army, Cad Harris became a supervisor at a nearby hospital. Franco attended Rancocas Valley Regional High School in Mount Holly. Franco was a standout in basketball, baseball and football for the Red Devils. Franco accepted a football scholarship to Penn State. He studied hotel and restaurant management, which seemed like a good idea because for much of the time with the Nittany Lions he served as a blocking back for teammate Lydell Mitchell. Still, in three varsity seasons, he rushed for 2,002 yards and 24 touchdowns. Despite the lack of gaudy stats, pro scouts were well aware of Franco. He was 6–2, 220 lbs. with remarkable quickness and agility. In the 1972 NFL Draft, Mitchell was taken in the second round by the Colts. Franco—his “caddy” at Penn State—went in the first round to the Pittsburgh Steelers. As an NFL rookie, Franco began the year on the bench. But in Week 5 he got 19 carries against the Houston Oilers and racked up 115 yards. Coach Chuck Noll made him a starter in Week 7 and Franco reeled off six 100-yard games in a row. Pittsburgh, a 6–8 team the previous season, finished with an 11–3 record and a division title. Franco ended his first season with 1,055 yards and was named Rookie of the Year. He reignited the passion of Pittsburgh fans, who formed Franco’s Italian Army. On the final play of Pittsburgh’s playoff game against the Oakland Raiders that year, Franco was in the right place at the right time. A desperate pass from Terry Bradshaw ricocheted into his hands, and he carried it into the end zone to win the game. The play was called the Immaculate Reception because officials ruled that his catch was “clean”—Bradshaw’s pass, intended for Frenchy Fuqua, had touched the Raider defender before Franco plucked it out of the air. Injuries limited Franco to 12 games the following season, but starting in 1974 he gained more than 1,000 yards seven more times for Pittsburgh. He helped the Steelers win four Super Bowls. His greatest game came against the Vikings in Super Bowl IX. He chewed up the Minnesota defense for 158 yards in a 16–6 victory. The Steelers are remembered as a great passing club and defensive team, but during their glory years, the constant they brought into every game was Franco, and everything keyed off of him. Fans got so used to Franco’s 1,000-yard seasons they often forgot that he was a fullback. He proved so productive and durable that, toward the end of his career, he actually threatened the NFL’s career rushing record. He finished with 12,120 yards. In Franco’s final season with the Steelers, he topped 1,000 yards at the age of 33. After one season with the Seahawks he called it a career. Franco was picked to play in nine consecutive Pro Bowls and was among the league leaders in rushing attempts, yards and touchdowns almost every season. 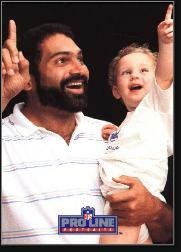 He was inducted into the Pro Football Hall of Fame in 1990. Franco's brother, Pete, followed him to Penn State in the mid-1970s and was an All-American safety in 1978, when he intercepted 10 passes.